Grazing on samples of kettle corn and bacon onion dip. Sipping pints of Shock Top. Watching people tee-off into Webber Point. This weekend, we made it back to Stockton for the “Best Food Fest in the West”: the Stockton Asparagus Festival. 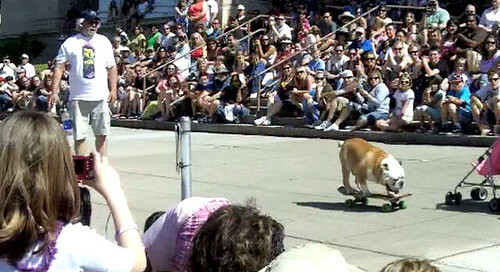 This year, I finally saw one of the star attractions: Tyson, the skateboarding bulldog. Before this weekend, the only time I saw Tyson ride was from the control room as I counted down my live crews to their next hit. It rocked to be out of the newsroom. I loved being able to cop a squat and watch Tyson wow the crowd with his boarding skills. Tyson, the skateboarding bull dog from Kris Vera-Phillips on Vimeo. Now, I wonder if I could get Daisy on a skateboard…. Comments Off on Good Dog!